I am not much into rock and Metallica in general. I just listen to two compositions by Metallica, namely "Nothing Else Matters" and "The Unforgiven". Fews lines from "The Unforgiven"
I have not yet been able to find a fault in the old man. Just remember a TV ad. A baby is born, his mom says I want you to be born. He grows up,I want you to study. The guy finally says "I just want to be ....... me"
When would I be me? Google started Gmail on 1st April, 2004 with a big bang but a handful of test users. Now after two and half months, they have started rapidly increasing their userbase through invitations. Being a gmail member since quite some time now, I am getting gmail invites almost everyday since past few days. This makes me feel that the final release of Gmail is not very far away now. The whole concept of 1 GB mailboxes triggered a revolution. One one hand, sites like AventureMail and SpyMac tried to take the initial advantage by providing the same or higher disk space before gmail goes public and thus increase their userbase. On the other hand, existing portals like Yahoo and Rediff have also increased their disk quotas. However, my personal opinion is that Google will still emerge as the leader with Yahoo as closest competitor. The primary reason here is because google's technology is far more superior than others. They have developed something called Google OS, great technology for backup and failure recovery. On top of it, They provide a great UI. Gullu has already written a review from a user's perspective. Yahoo will remain because of its spam filter(which is the best I have seen so far), messenger program and other portals like photos, briefcase, yahoogroups etc. But other sites don't have much to offer. Reminds me of Netscape and IE war. I have been living in Noida for like 2 months now. But it still remains a No-idea-what-to-do place for me during weekends. One reason for this is that I spend 3 weekends out of 4 in jaipur, my hometown. This weekend was different. Went out on all three evenings, watched Dev, met Shikhar and Vipul and found out that Vipul also stays in Noida. Dev deals with 2 cops, 2 friends, both have suffered the same trauma, but while one has gone against extremism, other has gone against a community. Sadly, most people I have seen are like Tej, who target a community for all problems rather than extremism. Amitabh Bachchan is brilliant as Dev. As a rational minded cop supplemented with karma, he preaches as well as works towards it. Dialogue delivery is fantastic, and though the subject of movie is pretty heavy, it rarely goes heavy on the viewer. Om puri also lives upto his reputation as Tej. Fardeen is okay and Kareena is not worth a mention. There have been communal riots and lots of people have died due to neglect of police. Dev is angry, Tej tries to console by saying that this is just collatoral damage. Dev Says "hum aur tum kaun hote hai yeh decide karne waale ki kisko jeene ka haq hai aur kisko nahi"
On this, Dev replies "Tum bach jaoge Tej"
It takes an Amitabh to deliver such dialogues. My profession has caused me to put many restrictions on myself. No staying awake late on weekdays. No movies, come back home early. Unlike most critics, I liked the movie though I felt it was a bit too long. After finally having both Hum Tum and Yuva in my kitty, I can now claim my movie lover tag back :-) which got lost after leaving bangalore. I always believe that life is a sinusoidal curve. Life is normal, then it starts becoming good, goes on to a peak, starts dipping until it can't do more bad and then things start improving again. But what if the time-period becomes very short. When the low moment comes before we fully enjoy the high moment. And worse, when it comes even before we start enjoying the peak. I am terribly confused. One part of me wants to think abt the peak of the curve and be happy, the other is thinking abt the trough it has created. Saif is trying to do something good for Rani but things somehow gets messed up, some fighting and rani is in tears whle saif ends up drinking. Saif hasn't said that he is in love with Rani at this stage. Though I feel most people would find it an overdose, this is one of the scenes where I noticed Saif's talent to do emotional scenes. Also, this is the first time in the movie where he clearly shows how much he really loves rani and where his character gains my empathy. Cheers to Karan Kapoor. On the photo on my profile, this is a digital passport size photograph I got in my final year at college to apply in various comapanies in campus. I got 25 photos but due to some great luck, 2 photos were sufficient for me during the campus recruitment. Since then this photo has been my most used and at most varied places. I dont have any hard copies of it left now but still have this softcopy which makes it my most used photo on the net also. I like this photo mainly because I seem a bit more fair in it than I actually am. Picked up another template from blogger and this one is looking. Finally have been able to put my pic on my profile. Looks like things are shaping up well. Blogger also provides an atom formatted RSS feed for the blog. But this is not displayed in any of the default templates. Looks like I will have to add it myself in the template. If you don't know what rss feeds are, check out this simple explanation by Rediff. 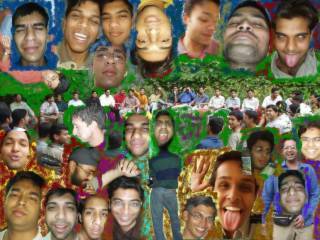 This collage was created by David (Anuj Dhawan). All the images are of my hostel batch mates (same hostel && same batch). All kumaon tigers who were cubs in 1998. Why did I name my blog omniscience. As dictionary.com says, omniscient is one having total knowledge, something unachievable by a mere mortal. Hence omniscient also means god, the almighty. So the uninitiated would say that this title simply depicts my extreme arrogance and immaturity. To be frank, a small part in me does agree to him. However, the larger part, which can never criticize me, does come up with an explanation(We all come up with explanations, dont we). It says that the meaning of omniscience here is knowledge-savviness and depicts that mission of my life is to be knowing everything. And having a mission that is unachievable is important as thats what makes me keep on living. I have still not been able to put my image on my profile. So much for omniscence ;).